I love Winnie the Pooh! We can't wait for this new movie...July can't come fast enough. 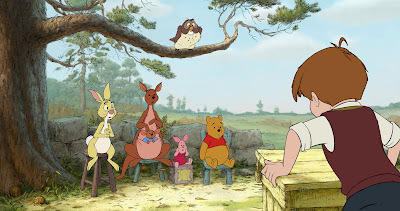 Inspired by five stories from A.A. Milne’s books in Disney’s classic, hand-drawn art style, Walt Disney Animation Studios’ “Winnie the Pooh” reunites audiences with the hunny-loving, philosophical bear and friends; Eeyore, Tigger, Rabbit, Piglet and Owl in a wild quest to save Christopher Robin from an imaginary culprit. Walt Disney Animation Studios returns to the Hundred Acre Wood with “Winnie the Pooh,” the first big-screen Pooh adventure from Disney animation in more than 35 years. With the charm, wit and whimsy of the original featurettes, this all-new movie reunites audiences with the philosophical “bear of very little brain” and friends Tigger, Rabbit, Piglet, Kanga, Roo—and last, but certainly not least, Eeyore, who has lost his tail. “Well a tail is either there or it isn’t there,” said Pooh. “And yours isn’t… there.” Owl sends the whole gang on a wild quest to save Christopher Robin from an imaginary culprit. It turns out to be a very busy day for a bear who simply set out to find some hunny. Inspired by five stories from A.A. Milne’s books in Disney’s classic, hand-drawn art style, “Winnie the Pooh” hits theaters July 15, 2011. · Veteran Disney animator/storyman/director Burny Mattinson (a key animator on the 1974 featurette “Winnie the Pooh and Tigger Too!”) serves as senior story artist, with a dynamic young directing duo—Stephen J. Anderson and Don Hall—at the helm. · “Winnie the Pooh” welcomes a few new voices to the Hundred Acre Wood: Craig Ferguson (“The Late Show with Craig Ferguson”), Tom Kenny (“SpongeBob SquarePants”) and Bud Luckey (director of the Pixar short “Boundin’”). · Actress/musician/singer/songwriter Zooey Deschanel (Indie folk band, “She & Him”) provides the vocals for a special rendition of the beloved “Winnie the Pooh” theme song. · London-born A.A. Milne (1882-1956), a noted writer and playwright, penned two books and several poems about the beloved Winnie the Pooh and Christopher Robin (named after Milne’s son). His books are actually collections of stories, five of which inspired the film. · A.A. Milne’s son’s teddy bear inspired the beloved character. The child named his bear after Winnie, a Canadian black bear from London Zoo. Pooh was the name of a swan they encountered together. · Filmmakers visited Ashdown Forest where Milne wrote the books and the real Christopher Robin spent his summer vacations. · Tony® Award-winning songwriter Bobby Lopez, and his wife Kristen, wrote the seven spirited new songs for Pooh and his pals, including “A Pooh Bear Takes Care of His Tummy,” “A Very Important Thing To Do,” “Everything Is Honey” and “The Winner Song.” Lopez is composer on several episodes of “The Wonder Pets,” which earned a Daytime Emmy® in 2006 for Outstanding Achievement in Music Direction and Composition. I'm your new follower on GFC AND on Twitter.